I've spent a little time each day on reviewing each classes posts to one another and also updating the class list of values. 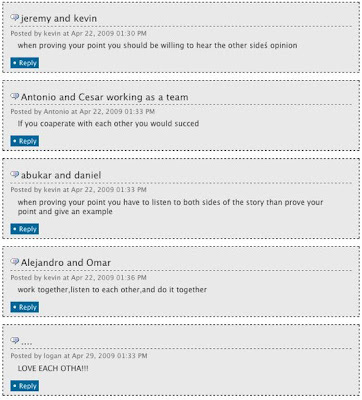 It has been cool doing activities and discussions in class as well as on line. I've been able to reference things students have said to our codified class list of values. Even students have referred to it a couple of times, including once when a student challenged another student saying that he wasn't adding anything new to the conversation, just repeating other people's stuff. 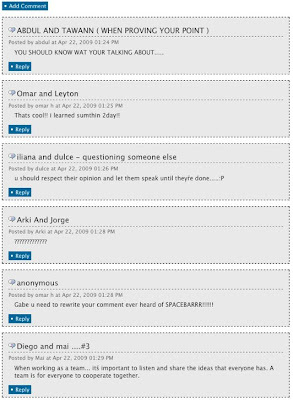 See the screen shots at the bottom showing Period 4's list and their comments listed below. This is an un-edited list, of course so you get what's there. 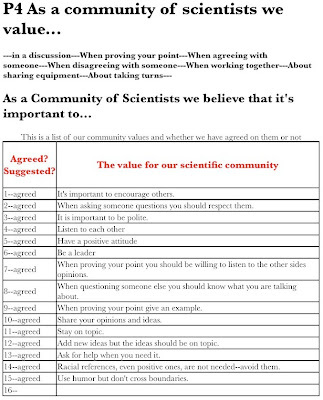 Don't have a list for each class, but have a single list of values that all of my science students and I can agree to. What's a process by which to do this that is effective and maintains all students buy-in? Is this possible while allowing for and developing the unique personalities of each class? Bring professional scientists into this dialog. Find effective ways to grow the culture--for example, start with just a couple at the start of the year and constantly re-visit the list, adding and improving and changing as the year goes on? What are different strategies to bringing this to life in daily class? That is, what is scaffolding for both the students and I to help us develop the habit of mind of referencing what we do relative to agreed upon community values. How do we keep this a living list? Of course, all of the answers must be practical or they won't be used! Here are 3 screen shots showing period 4's web page of values..